Ben Ezra Synagogue “The prayer-place of the Jews” is sometimes called El-Geniza synagogue and it is located in old Cairo on the site where baby Moses was found. The storeroom of this synagogue was found in the 19th century and it contained a treasure of abandoned Hebrew, Aramaic and Judeo-Arabic secular in addition to some sacred manuscripts. It was originally named El-Shamisen Church, and is situated today behind the “Hanging church”. So from this point, we can say that Ben Ezra synagogue was a church and Jews bought it from Christians in 882 AD to pay the annual taxes to the Muslim rulers at that time. Abraham Ben Ezra was the one who bought the church from the Christians and he paid 20,000 dinars. The Geometrical Decoration: This decoration which dates back to the Turkish period can be seen on the side walls of the synagogue. It has patterns such as star patterns, pentagonal patterns, and rectangles. Floral Decorations: These decorations were used as a background for the Geometrical patterns and they are also used in the star of David in the ceiling of Ben Ezra synagogue. It includes floral patterns in addition to palmettos and a lotus flower. The style of the carving on the Torah ark door is a representative of the Mamluk Sultanate specifically during the 15th century. There is a medallion decorating the door designed with a motif common to bookbinding of that period. The 15th-century fire in Ben Ezra synagogue damaged the bimah or pulpit. One plausible theory is that wood from the damaged bimah was repurposed to make a new door for the Torah ark. The synagogue was repaired and renovated in 1488. 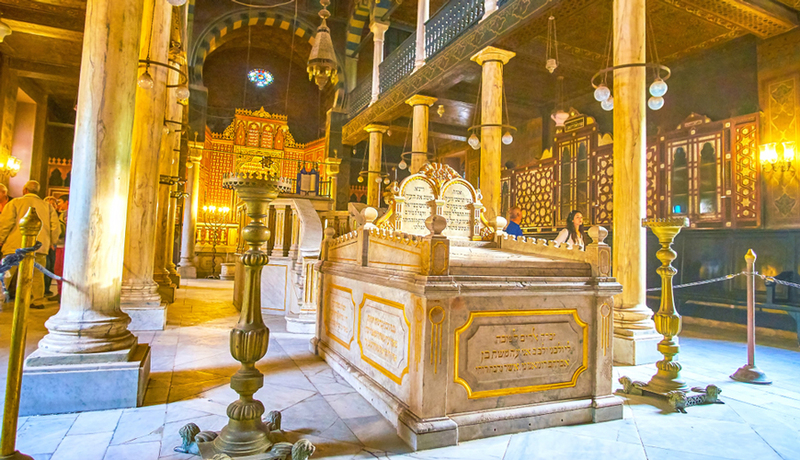 The Jewish community in Egypt is considered to be at the end of a dramatic decline. As in 1920, it was estimated that 80,000 Jewish people live in Egypt but now less than a dozen of them live there. That is why the Ben Ezra synagogue functions as only a museum for tourists and it doesn’t act its function as a functioning congregation.